In Delphi, the mountain city deemed by the Greek gods to be the center of the Earth, a cult of neo-pagans re-create with painstaking authenticity ancient rituals to glorify the god Apollo and deliver oracles to seekers from around the world. When antiquities are stolen from a museum in nearby Thebes, British archaeologist Sarah Weston and her American partner, Daniel Madigan, are drawn into a plot that goes beyond harmless role-playing: someone’s using the Delphian oracle as a smoke screen for an information exchange, with devastating consequences for the Western world. Pitted against each other by the cult’s mastermind, Sarah and Daniel race against time and their own personal demons to uncover clues left behind by the ancients. Their mission: to find the original navel stone marked with a lost Pythagorean formula detailing the natural events that led to the collapse of the Minoan Empire. But will they find it in time to stop the ultimate terrorist act? Daphne Nikolopoulos in an award-winning journalist, author, editor, and lecturer. Under the pen name D.J. Niko, she has written two novels in an archaeological thriller series titled The Sarah Weston Chronicles. Her debut novel, The Tenth Saint (Medallion Press, 2012), won the Gold Medal (popular fiction) in the prestigious, juried Florida Book Awards. Her follow-up release, The Riddle of Solomon, continues the story of British archaeologist Sarah Weston as she seeks the relics—and mystical secrets—left behind by the biblical King Solomon in remote Israel. Daphne is currently at work on The Oracle, book 3 in The Sarah Weston Chronicles, which releases in 2015. Also slated for publication in 2015 is her first historical novel, The Judgment, which is set in Israel and Egypt in the tenth century BCE. In addition to writing fiction, Daphne is editor in chief of Palm Beach Illustrated magazine and editorial director of Palm Beach Media Group. Prior to that, she was a travel journalist who logged hundreds of thousands of miles traveling across the globe, with emphasis on little-known and off-the-beaten-path locales—many of which have inspired her novels. Daphne frequently lectures about her research on the ancient world. She is an instructor at Florida Atlantic University’s Lifelong Learning Society, teaching on the subject of archaeology. She has also spoken to audiences at the Jewish Community Center of the Palm Beaches’ Academy for Continuous Education, and several libraries and private groups throughout Florida. Born and raised in Athens, Greece, Daphne now resides in West Palm Beach with her husband and twin son and daughter. You can find her on the Web at djnikobooks.com and connect with her on Facebook (AuthorDJNiko) and on Twitter: @djnikobooks. 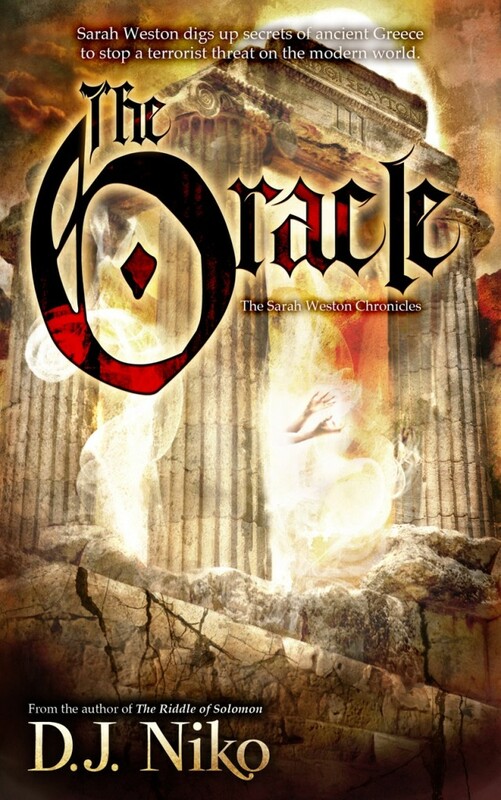 To enter to win an Advanced Reading Copy of The Oracle by D.J. Niko please complete the giveaway form below. Two copies are up for grabs! ⇒ Giveaway is open to residents in the US, UK, and Canada. ⇒Giveaway ends at 11:59pm on June 26th. ⇒You must be 18 or older to enter. ⇒Only one entry per household. ⇒All giveaway entrants agree to be honest and not cheat the systems; any suspect of fraud is decided upon by blog/site owner and the sponsor, and entrants may be disqualified at our discretion. ⇒Winners will be chosen via GLEAM on April 27th and notified via email. Winners have 48 hours to claim prize or new winner is chosen. ⇒Please email Amy @ hfvirtualbooktours@gmail.com with any questions. Sounds like an exciting read, a bit of mystery, history and archaeology - a wonderful combination. Thomas M.D. Brooke's Roman Mask - Release Day! Cat Thursday - I Forgot!! !